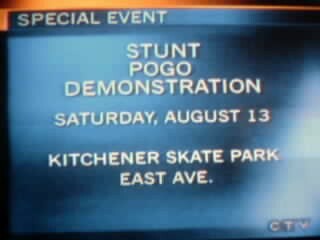 I was planning the Candian Stunt Pogo Demo. I really wanted it to get Publishitied so I called a local TV Sation asking if they could help. They loved the idea of Stunt Pogo Sticking and asked if they could interveiw me live on TV with some other Stunt Pogo Stickers. of corse I said yes. But most of the people I pogoed with only mainly knew howd to bounce. My other three friends who were good were on hoildays. But there was one person. He lived three hours away and was coming with his friend to the demo. I asked him if he could come and happly agreed. But there was one problem. I couldnt get a pogo. Mine broke a while ago and my parents were sick of lending me money. I tried everything to get one but I couldnt. I asked my dad so much that he finally gave in and we went to toys r us and bought a bottom spring pogo stick for 15 dollars. It really was dreadful but would get the job done. Of the day of the interview I woke up and was all excitied. I threw on some cloths and got straight outside and pogoed. Soon it was time to leave and my father drove me over to the sation. We rang the buzzered in the parking lot and tey let us in. My dad had to leave for work and couldnt stay so he left. I found my way to the front doors and opened them up. I went up the the front desk and told the ladie I was here. She got excitied and ask if she could see a few tricks. I was surprized because it was the main lobby with a lot of exspenice furniture but she insisted. I started from easy tricks and worked my way up. Other people stopped and started walking past me. Than I stopped and seated on the bench and talked to the ladie a little more about the sport. Than I glanced over the window and saw a person jumping up and down. I stood up and saw that he was on a pogo stick. It was Chris Godwin and his father. I went outside and interduced myself. It was a bit awkward but it always is when you meet someone for the first time. We had a lot of time to talk and pogo intil we say Kyle. The person who was interviewing us. He interduced himself and told us he was ready and to follow him. We were going to Pogo in the studio but he got a bit nervous with all the exspenive epuitment and took us to do it in the parking lot. Again we had tons of time to talk and pogo. About 30 minuets later the camera man called us over saying we'd be on in ten minuets and gave us mini microphones. We attached them to are shirts. Five minuets later Kyle came out and told us a out line of what he will be asking us. Than the camera man said 30 seconds and we all got set up and went. We talked to him about what we do, how long we have been pogoing, why do we do it, what kind of tricks do you do, about the demo. And we had about One minuet to show are tricks. It went pretty smoothly and fun besides the point that I was hogging a lot of the questions and messed up describing the tricks. But besides that it was really fun. It ended and we both got tapes. We quickly visited the skatepark we would be demoing and Chris's dad drove me home. It was a really exciting day.